Alina and Mal must find the firebird, kill the Darkling and save Ravka. That is what pushes Alina to build her strength after a confrontation that nearly killed her. Hiding underground she must get stronger and survive the clutches of the Apparat who has built her into a saint for the people of her country. She must break free and find the prince who is rumoured to be dead, and put an end to the suffering of her country. All is not well in Alina’s world and it will get worse before there is even a glimpse of hope, but can she survive that long? What a conclusion, my heart is in pieces and my feelings are all over the place. I’m not even convinced I can put them into coherent views for a review, but I will try. I re-read the first two books in this series before I read Ruin and Rising and I am so glad I did, three out of my last four books took place in the world of the Grisha and that has made me love it even more. The breakdown at the end of the second book sets readers up well for the events of the third and reading them close together really helps you get into the characters mindset. Its quite difficult to go into the story of this book without spoiling the others so please don’t read on if you are new to the series. We start with Alina almost dying from attacking the Darkling with his own weapons. She has taken refuge with the Apparat and a group of his followers who believe she is a saint. There is a lot resting on faith in the Apparat and she doesn’t fully trust him, especially as he seems happy enough for her not to get her power back. I loved the beginning of the book because it really showed what life could be like for Alina if she gave up. However her strength shone through and we end up following her on her journey to save her country. Everything about the book from that point on was just incredible and the characters did a lot to make me love them. I adored how real they were and how they had their own mini-stories along with Alina. I loved how Zoya’s mean personality was her way of showing how much she cared and how Misha was so protective even though he was only such a small child himself. I felt as if they were all my own friends and allies and I didn’t want any of them to leave me. There is a lot of death and distraction in this book and its hard to read in places. People you think cannot die do and those who you sometimes think you could live without surprise you in so many ways. What made me love the book so much though was how much I felt I was a part of it. This series has a special place in my heart because I feel like I have lived among the characters. I said in my previous review for Siege and Storm that I felt as if I was abroad the ships and in control of my own weapons when it came to the imagery of the book and Ruin and Rising delivered yet again with me feeling wind in my hair when on Nikolai’s inventions and picturing the view of the mountain ranges Alina visits. This book had me in tears, but it also made me laugh and kept me hooked all the way through. It was fantastic and for a while I was worried about where it would go, but it delivered what I needed it to. I am very happy with the ending and although there were some things I didn’t want to happen I know they did for the good of the characters and the story associated with them. 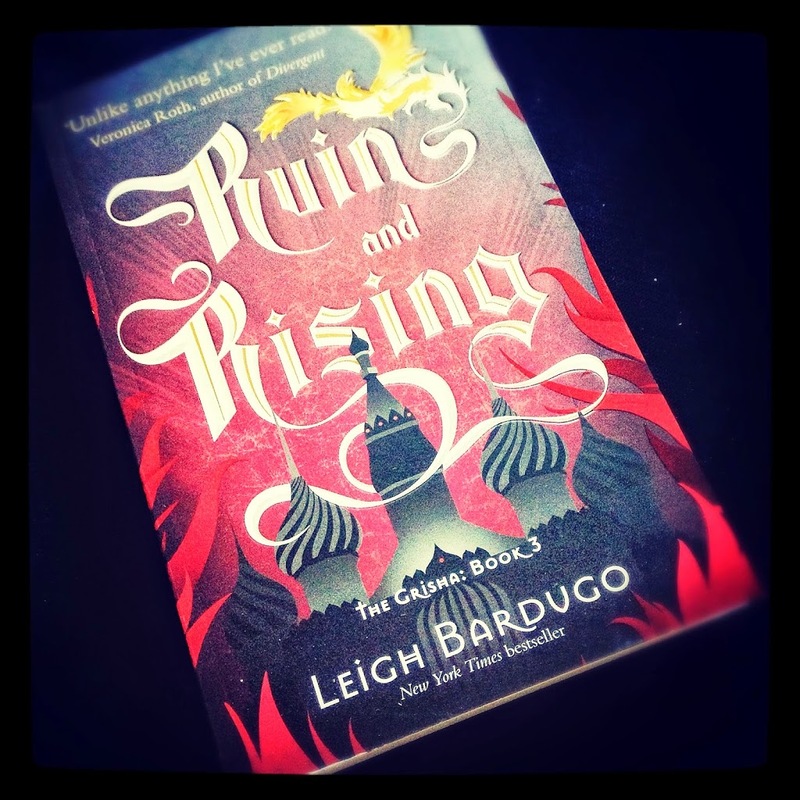 Ruin and Rising was published on June 19th by Indigo. My copy was pre-ordered from Hive. The book was an exhilarating ride but the ending left me cold. It all came to a grand finale but the ending simply broke my heart. This is what happens if you get too invested into characters.